Today I got two quilt tops put together. 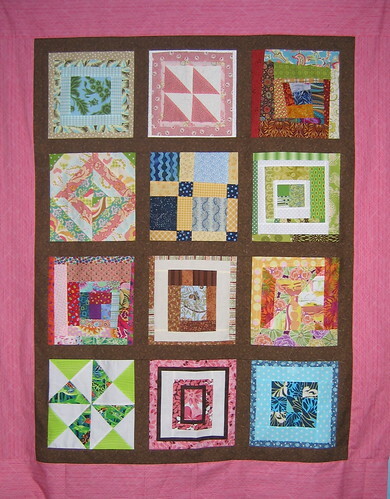 The first was made from 12 blocks I received in the past year from the Quilt Block Exchange. I added the brown sashing since I had it and then added the pink border to make it a bit more girlie. For this one I pulled out some 'boyish' squares that I had in my stash and added a few more. 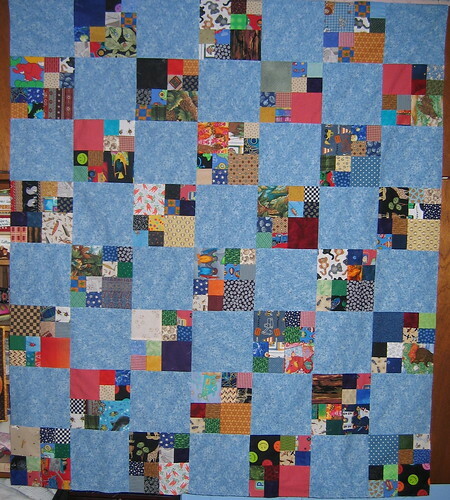 Added the blue alternate squares so now I have a boy quilt on hand also. My hubby and I are heading down to Colorado for a memorial service for our brother-in-law who died suddenly last week and when I get home I am going to be busy in the sewing room getting as many quilts finished as possible for the quilt show for our Relay for Life team at church on May 8. Hopefully we get a good turnout and raise a lot of money to help fight cancer! If you are interested in helping me reach my goal for fund raising you can do so online here.